We are entering a transformative period for the ultra-wealth business. It is driven by a tectonic shift of demographics that is leading to an enormous transfer of wealth, monetization of private businesses, and a new workforce that will define the future. 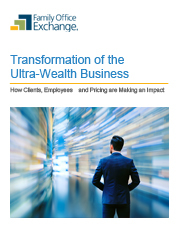 By pairing findings from the 2018 FOX Multi-Family Office and Wealth Advisor Study with in-depth observations from FOX subject matter experts, Transformation of the Ultra-Wealth Business: How Clients, Employees and Pricing are Making an Impact can serve as a useful resource for those seeking insights on the evidence and impact of major transitions in the business and how leading firms are responding. Opportunities and challenges associated with private businesses and families in transition. Progress that leading advisor firms are making in harnessing their culture to attract talent and lengthen their tenure with the firm. Fundamental change in pricing structure that is being driven by what clients need and value. This report is available to Advisor Members of FOX who subscribe to FOX Research, and all Family Office Members.